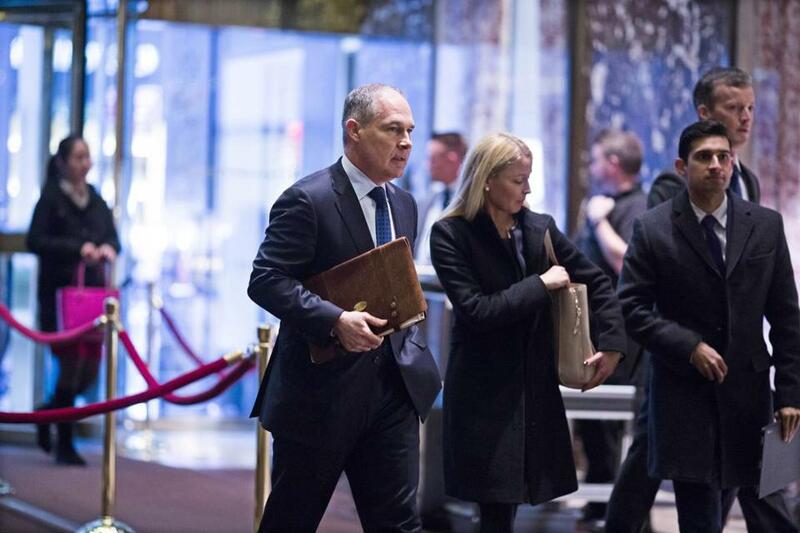 Oklahoma Attorney General Scott Pruitt (left) arrived at Trump Tower in Manhattan. ‘‘My administration strongly believes in environmental protection, and Scott Pruitt will be a powerful advocate for that mission while promoting jobs, safety and opportunity,’’ Trump said in an early morning statement. According to NASA, 97 percent of the world’s climate scientists agree that the planet is getting hotter and that burning fossil fuels is the primary cause. Ten of the warmest years in history have occurred in the past 12, with 2016 on pace to be the hottest recorded. Studies show the Greenland and Antarctic ice sheets have decreased in mass, while the world’s oceans have risen on average nearly 7 inches in the last century. New York Sen. Chuck Schumer, set to become the Senate Democratic leader, said his party plans to press Pruitt with ‘‘tough questions’’ in his confirmation hearing. ‘‘Attorney General Pruitt’s reluctance to accept the facts or science on climate change couldn’t make him any more out of touch with the American people — and with reality,’’ Schumer said. ‘‘Respect for private property rights have allowed our nation to thrive, but with the recently finalized rule, farmers, ranchers, developers, industry and individual property owners will now be subject to the unpredictable, unsound and often byzantine regulatory regime of the EPA,’’ Pruitt said last year. Trump has called global warming a ‘‘hoax’’ and said he plans to abandon the U.S. commitment to reduce carbon emissions as part of the international agreement signed last year in Paris. During the campaign, the New York billionaire said he would like to abolish the EPA, or at least gut regulations he says impede corporate profits. He fought against climate change policy. Now he’s tapped to lead the EPA. Associated Press writer Sean Murphy reported from Oklahoma City.